Mauri Ditzler, Dean of the College, has announced the following awards given at a recent Student Honors, Awards, and Prizes Chapel held at the College. The Phi Beta Kappa Prize was established to encourage original work of high creative and scholarly merit, as distinct from proficiency in normal course work. It is a cash prize given by the Wabash chapter of Phi Beta Kappa to that undergraduate who is judged to have produced the most original and meritorious piece of work, whether artistic and analytical. The Community Service Award is given to the student who has embodied the spirit of selfless community service to Wabash College, Crawfordsville, and Montgomery County. The Indianapolis Alumni Student-Athlete Award is given to a senior who has made a significant contribution to athletes at Wabash and who has achieved a respectable grade point average. The Pete Vaughan Award commemorates the 30 years of distinguished service Robert E. "Pete" Vaughan, a 1924 Wabash graduate, dedicated to Wabash as coach and athletic director. The Malcolm X Institute Merit Award is given annually to those seniors who, in the judgment of the director, have made significant contributions to the Malcolm X Institute during their tenure at Wabash College. •Paul T. Hurt Award for All-Around Freshman Achievement: Thomas J. Elliott, Jr. The Hurt Award is made by the dean of students from nominations submitted by all living units on campus to a deserving freshman student in recognition of all-around achievement in his first year at Wabash. The Angus Scientech Award made by the DJ Angus-Scientech Education Foundation goes to a student in recognition of excellence in science, mathematics, or social sciences who has shown exceptional improvement in academic performance over the last year. The Daugherty Award is given to a student from Montgomery County who has shown significant intellectual and social growth and achievement as a result of the Wabash experience. The Petty Prize in nature writing is an annual competition instituted by Dr. W. Franklin Harris (Wabash '64) to honor the late Robert O. Petty, professor of biology at Wabash. It is given to the student whose essay or poem which, in the view of the judges, best preserves the cogent clarity of Petty’s quest. The Dean Stephens Award is given to a member of the junior class who best reflects the broad intellectual and personal interests, the high moral courage, and the humane concerns of Dean Stephens, a member of the Wabash coaching staff who was killed in an airplane crash in 1958. The Stephens-Hall Senior Scholarship Award was established in memory of Waldo Stephens and Andrew David Hall, and is presented to a senior of demonstrated worth who plans to continue his education. The Salter award is given to a member of the junior class who best exemplifies the characteristics of scholarship, character, leadership, and service Dr. Lewis Salter embodied as a Wabash faculty member and as Wabash's twelfth president. The Senior Award of Merit is awarded by the Student Senate in conjunction with the National Association of Wabash Men to the senior who, though out his years at Wabash College, has demonstrated outstanding achievement in scholarship, service, and extracurricular activities. The Student Honors, Awards, and Prizes Chapel is held every year at Wabash to honor students with awards and prizes for their outstanding work they have demonstrated throughout their college years. Top right: Associate Professor of Speech David Timmerman was honored with the McLain-McTurnan-Arnold Award for Excellence in Teaching. 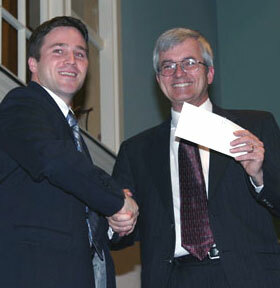 History professor Steve Morillo was named the McLain-McTurnan-Arnold Research Scholar. 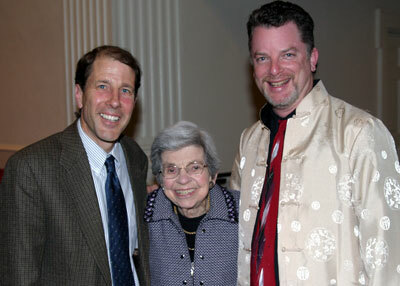 Both professors were congratulated by Mrs. Elizabeth McLain (Mrs. Reid H. McLain, Class of 1927). Lower left: Indianapolis Association of Wabash Men President Brad Johnson '71 presented senior Chris Healy with the Indianapolis Alumni Student Athlete Award. The two-time All-American, who finished second in the NCAA Division III National Championships, also earned the College's Pete Vaughan Outstanding Athlete Award. 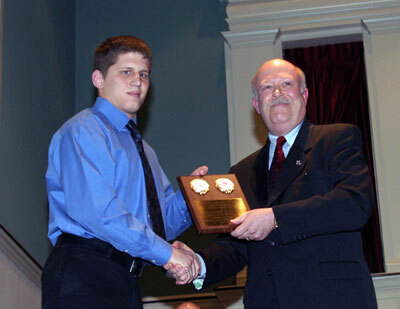 Lower right: Junior Chris Ogden was this year's recipient of the College's Dean Stephens Award.